I underscored the importance of ad placement and blending in order to increase Google AdSense earnings a couple days back, and several readers wanted to know if there was a better way of figuring out the optimal position for an AdSense unit. The method I suggested in that post was to use Google's heatmap recommendation as a starting point. A heatmap simply keeps track of where your readers are clicking and shows you the results graphically. As another example, to the right, you can see Google's recommendation for ad unit placement on blogs. 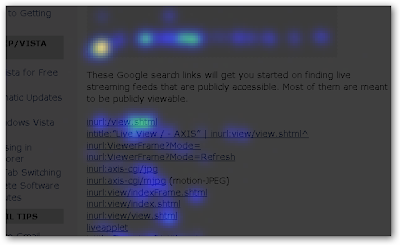 But Google's heatmap and sample implementation is too generic to be useful for many bloggers. So how do you figure out the best placement for your blog? It's simple: Generate a custom heatmap of your own. CrazyEgg is probably the best heatmap tool out there (sign up for the free plan to test it out), but you can also use Google Analytics to track where your visitors are clicking (under Content->Site Overlay). CrazyEgg is an extremely useful tool not only for positioning advertisements, but also for deciding where to place other objects like an RSS subscribe button to maximize exposure to new readers. Using CrazyEgg, you can also segment readers by referrer (Google vs. StumbleUpon vs. direct) to see how different visitors interact with your blog using CrazyEgg's Confetti view. An excellent Problogger article posted a couple days ago has more details on using heatmaps. Brighter areas are more clicked on. The bright yellow spot at the top is the play button for an embedded YouTube video, and it's easy to see how popular it is. 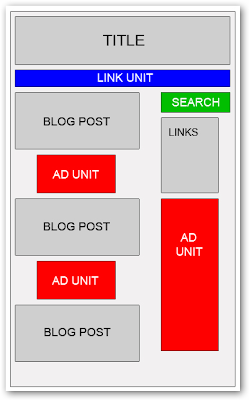 You can use these details to figure out where to place your AdSense ads for best results. Typically, the area at the top left of the page is the "hottest" area on a heatmap since English readers scan from left to right. Other prominent features like a YouTube player or a big orange RSS subscribe button also tend to get more clicks. So once you've figured out where readers are clicking, you can place your AdSense blocks in these prime locations on your webpage and track how well they perform. Then gather data for a few thousand ad impressions, and you'll be able to see exactly where on an ad a user is clicking (Is it the ad title, link, description, white space, etc.?). This will let you know which attributes of an ad you should be testing, and you can design split tests of these elements to see how changing them affects clickthrough rates. More on split testing in a future article. Then move the ad to a different position and start gathering data all over again. Rinse and repeat. Remember to keep split testing your ads at each new location. This way, you'll get more bang for your buck. Test as many attributes as you can while still being able to track each ad variation's performance. Update: WordPress users may also want to try out the Click Tracking plugin, which doesn't have any limits on how many visits you can track. Awesome post. I just setup my CrazyEgg account. Ready to get rolling! Get info. I'm new tyo blogging so this is exactly the info I was looking for. I was aware of Google's heatmap,but not the one you mentioned. I'll definitely try it out. Great job & thanks again. and let me know what you think?